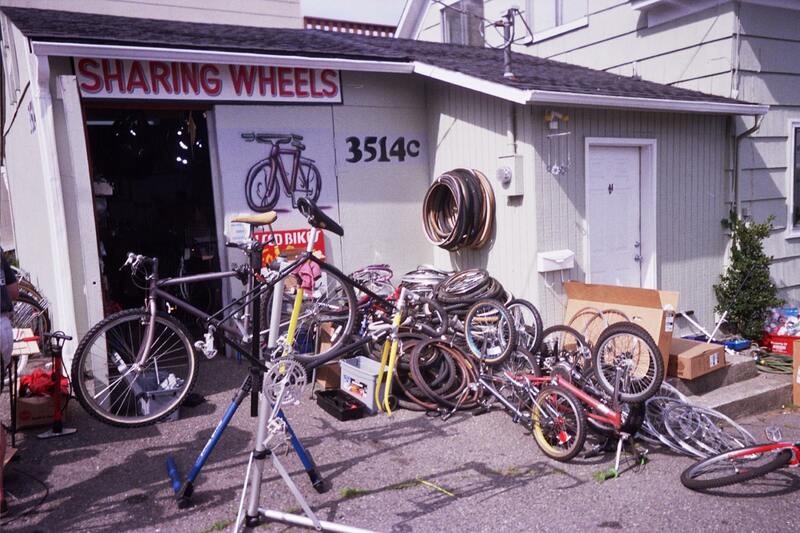 In 2002, Sharing Wheels began life providing basic bike services at the Everett Gospel Mission, while giving neighborhood kids (big and small) a place to hang-out, get greasy, and share bike love. That same passion for bicycles and for helping others use bikes is what sustains us as a community bike shop today. This past year, about 85% of our customers were low income people. We hosted our 15th annual Kids Bike Swap and donated 100 refurbished kids bikes to Christmas House. We’ve expanded weekend hours and increased sales by 50%. Our shop is full of both basic and unique bikes* and tools and parts to fix the bike you love. Our nonprofit board meets monthly. We dream of a bigger shop, more classes, and more programs for people who ride bikes – out of love, necessity, or both. We are working to expand our presence and impact in the greater Everett community. In this season of giving, we ask each of you to consider a financial donation to Sharing Wheels at a level that is meaningful to you. One generous volunteer has already donated $500. Two of our board members have also committed $500 each – but they will double their donations if we can raise $1,000 match from you, our community of supporters. Our shop is invaluable to many, and there’s a price for free access to tools, hands-on help, and the space we rent to hold all those wonderful bike things. Did you fix a flat at the shop this year? Borrow our tools? Find the right screw or specialized part? Are you glad someone else was able to get a low-cost bike or used part? With so many of our customers living in poverty, it’s especially important for those of us with a little extra to contribute – for ourselves, and for those who can’t. We are a 501(c)3 charitable nonproft. You can donate now via PayPal on your credit card, or come by the shop with cash, check, or credit. Send checks to Sharing Wheels, 2531 Broadway, Everett WA 98201. * Come buy a bike: We have a recumbent bike that needs TLC, bikes from Spain, Italy, Britain, Japan, and France, and lots more.